Founded in 2008, Ergon Ensemble comprises a group of most talented soloists, all graduates of the Internationale Ensemble Modern Akademie. An extremely flexible ensemble of immerse versatility, Ergon is based on a core formation of musicians that is further reinforced, depending on the project, by a great number of guests and exceptionally talented musicians. Besides its critically acclaimed concerts, the ensemble is also involved in educational activities, CD recordings and interdisciplinary collaborations combining various forms of performing arts such as dance, music theatre and multimedia projects. 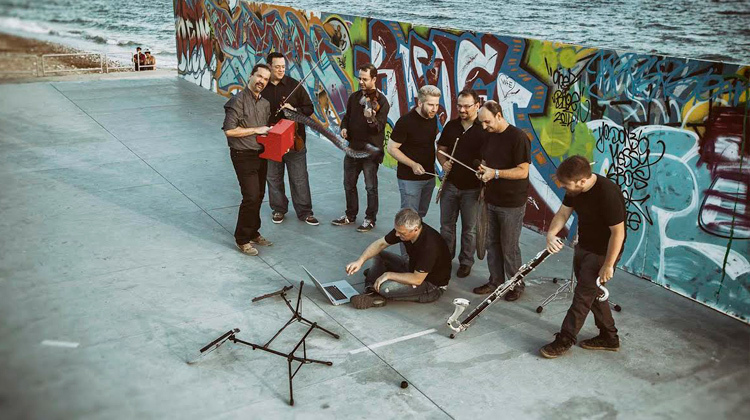 One of the leading contemporary ensembles in Greece, Ergon Ensemble has appeared in renowned venues and music festivals in Athens and abroad, having received great critical and audience acclaim for the quality and precision of its performances, as well as its ambitious and exciting programs. Besides its dedication to the repertoire of the 20th and 21st centuries, Ergon, as an Athens-based ensemble with the advantage of direct access to the contemporary compositions by Greek composers, is focused on the endorsement of Greek music internationally. Recent highlights include its participation in the Suså Festival in Denmark, the International Pharos Contemporary Music Festival in Nicosia-Cyprus and the Bigli New Music Festival in Istanbul-Turkey, and productions like “Silent Film and Music”, “Peter Maxwell Davies: Icones”, “City Lives” and “Dream” at Megaron-the Athens Concert Hall, “Tribute to Claude Vivier”, “Alternativa” and “Balkan Project” at the Onassis Cultural Centre-Athens, “Music and Electronics” at Goethe Institut-Athen. During the last seasons, Ergon Ensemble has furthermore implemented a number of educational projects, focused on the encouragement of contemporary music creation amongst the youth. Ergon Ensemble collaborates closely with the German leading exponent of the contemporary music Ensemble Modern, which regularly invites Ergon’s soloists to Frankfurt to join forces in its concerts. During 2013-2015, Ergon Ensemble has been kindly supported by the Ernst von Siemens Music foundation.